With flu and cold season in full swing, it can sometimes be hard to tell what is causing your sniffles and sore throat. According to the latest numbers from the U.S. Centers for Disease Control and Prevention, 19 states are experiencing high levels of flu activity and 13 children have died so far from the flu this season. So what can you do to protect yourself? Besides getting a flu shot, it can also be helpful to know the difference between the flu and the common cold. While both are respiratory illnesses, they are caused by different viruses, the CDC says. "In general, flu is worse than the common cold, and symptoms are more common and intense," the CDC says. Colds are usually milder than flu. In addition, colds usually don't result in serious health problems, such as pneumonia, bacterial infections or hospitalizations. The flu, on the other hand, can have very serious complications. 1. How did symptoms start? If symptoms began abruptly, you may have the flu. Generally, cold symptoms come on more gradually. While fever is a common symptom with the flu, it's rarely present with a cold. 3. Do you feel achy? Usually, people will experience body aches with influenza. They are less painful and less common when a person has a cold. 4. Do you have chills? It's common for people with the flu to have chills, but this is not the case for people with colds. 5. Do you have a headache? Headaches are pretty common with the flu, but they're not all that common with the cold. 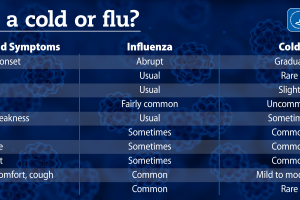 Below is the CDC's complete chart comparing cold and flu symptoms.